For this genealogist, 2012 was a particularly good year. My research trip to Chicago revealed that my g-g-grandfather was the first entry in the Cook County tract books for the family’s longtime property, several years before I had originally thought. Subsequent research in the Recorder of Deeds office confirmed this, as well as an earlier marriage. The other big discovery of the year centered around the Kamp family of western Pennsylvania. For years, I was unable to find any trace of Frank Kamp or his wife Mary following the 1920 Census. Yet with the December 2011 changes to the vital records laws regarding public access to Pennsylvania vital records, the floodgates opened to my personal research. Indeed, I had finally solved my most enduring and frustrating genealogical mystery. As it turned out, Mary Kamp died in 1927, and her husband Frank died later in 1940; both are buried in Mount Lebanon Cemetery, the same cemetery I visited a few years ago researching a different line of the family. As with any discovery, new questions immediately surface. Where was Frank in the 1930 and 1940 censuses, and why am I struggling to find him? Professionally, 2012 also brought big changes, the most important being a new position at the Archives of Michigan. Now as a Senior Archivist, I work closely with the Abrams Foundation Historical Collection, as well as outreach and programming in support of the Archives’ outstanding holdings. I look forward to the challenges of my new position, learning the intricacies of an exciting and unique archival collection, and maintaining my relationships with the Michigan genealogical community. Recently elected to the Board of Directors, I also look forward to becoming more involved with the Federation of Genealogical Societies. So what will 2013 bring? With a March trip to Salt Lake City and a fall jaunt to Fort Wayne (IN) already on the schedule, I can hope for an exciting and rewarding year of genealogical discovery. I’ve written before on my family’s long-time home in Chicago, the “house on Kimbark.” On my recent research trip to the Windy City, one of my top priorities was to investigate when my great-grandfather actually bought the property, and if I was lucky, perhaps identify if my ancestors were among the first residents at the address. A trip to the Cook County Recorder of Deeds would hopefully shed some light on my questions. 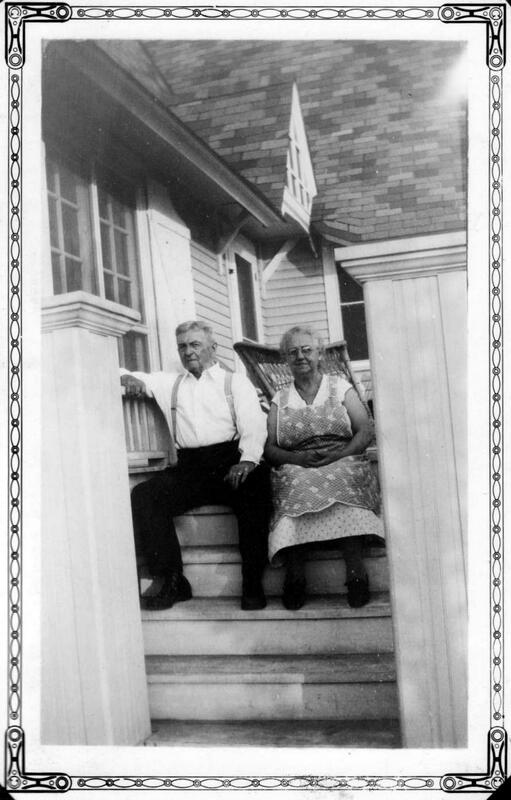 Based on previous research and family tradition, I suspected Sophus Hansen (1860-1945) first moved to 7042 S. Kimbark in the mid-to-late 1890’s, soon after he married Rose Grobner (1878-1939). Sophus first appeared at the address in the 1899 Chicago city directory and remained there for nearly 50 years until his death in 1945. 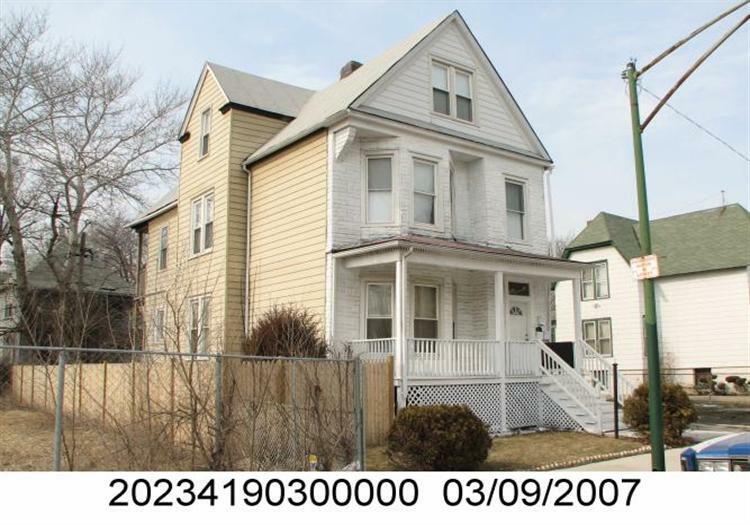 In their outstanding property search database, the Cook County Assessor’s Office has recently estimated that the house is 112 years old, placing the construction date at c.1900. 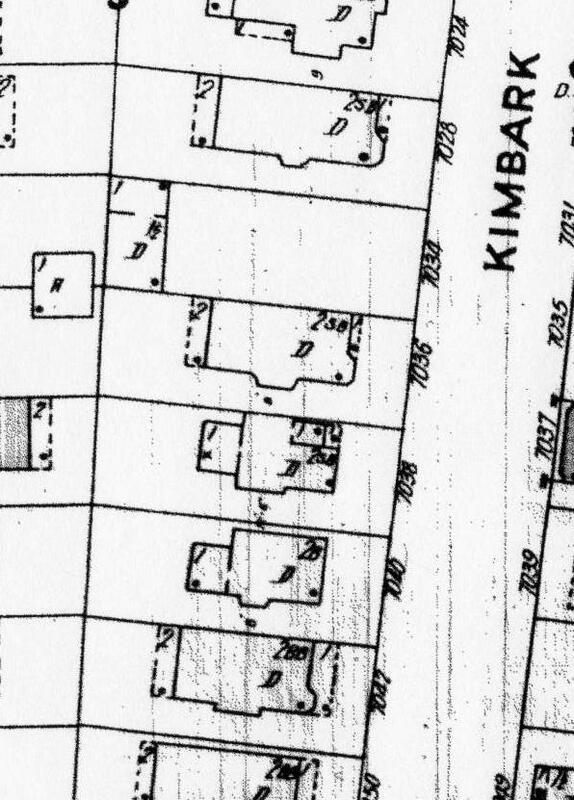 Here is a closeup image of the 7000 block of S. Kimbark Avenue from the 1895 Sanborn Fire Insurance Map for Chicago, clearly showing the footprint of the residence at 7042. Sanborn Fire Insurance Map: Chicago, IL (Vol. 16: 1895), p. 87; 7042 S. Kimbark. Located near the bottom of the image above, the residence is already there in 1895, tightly hemmed in on both sides. Since the house was built by the time Sophus was first listed there in the 1899 city directory, perhaps he was there before? Tract Book, Vol. 393, p. 149; Cook County (IL) Recorder of Deeds. Two of the first entries for that property tie directly to Sophus Hansen. Dated 1887, this was quite a few years before I first estimated he was at the address, and in fact, only a month after his marriage to his first wife, Ursula. Owning a property and having a house built there are two very different things entirely, so I maintained visions of grandeur that the Chicago building permits from the time period would reveal more about the construction date. However, as that collection only contains permits for structures built within the Chicago city limits, there was no record for the house’s initial construction. Indeed, at the time the Kimbark house was built, it was still part of Hyde Park, which was later annexed by Chicago in 1889, several years after my family home was already likely constructed. I recently discovered this gem of an historic photograph, taken in c.1913. Although the trees obscure much of the house, one can still get a sense for the architecture, particularly the front porch. It is the only full-view historic image of the house that I’ve found. 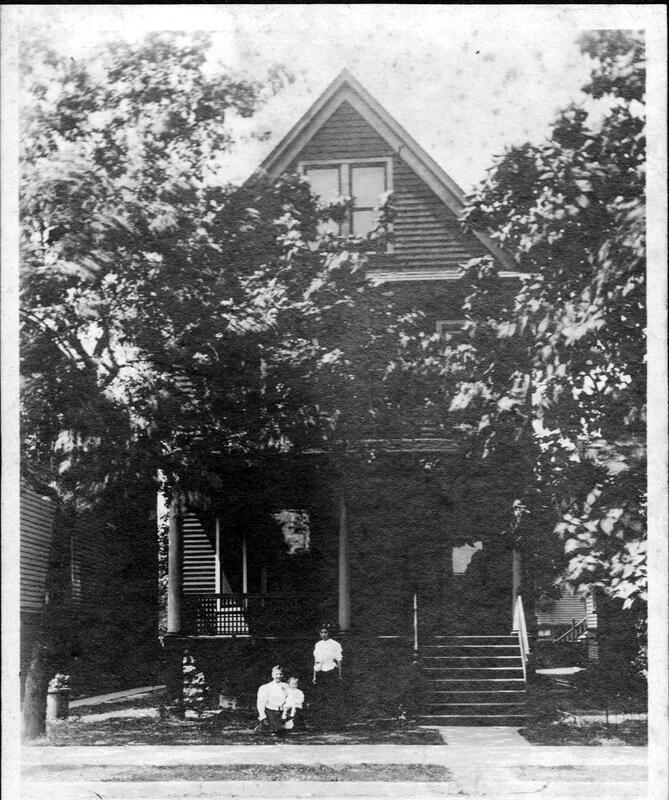 7042 S. Kimbark Ave., Chicago (IL), c. 1913. The older woman kneeling is likely Frederica Jarand Grobner (1854-1930) and the young woman on the right is likely Lydia Vierke Grobner (1886-1952); the young child is unidentified, although perhaps a child of Lydia’s. Moving forward a few years, here is another image. 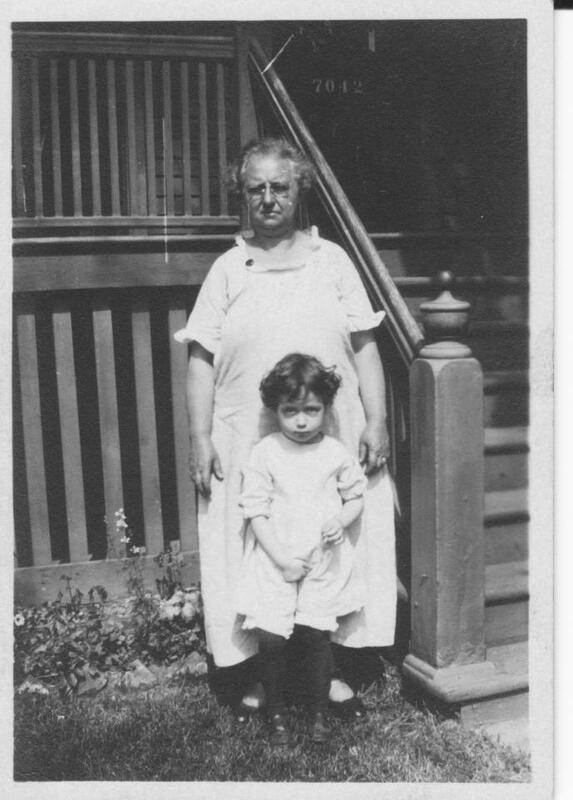 Rose Hansen & Shirley Russell, 7042 S. Kimbark, Chicago (IL), 1925. Although no one is particularly happy about getting their picture taken here, I’m thrilled that it was, particularly given the visible “7042” on the front door. 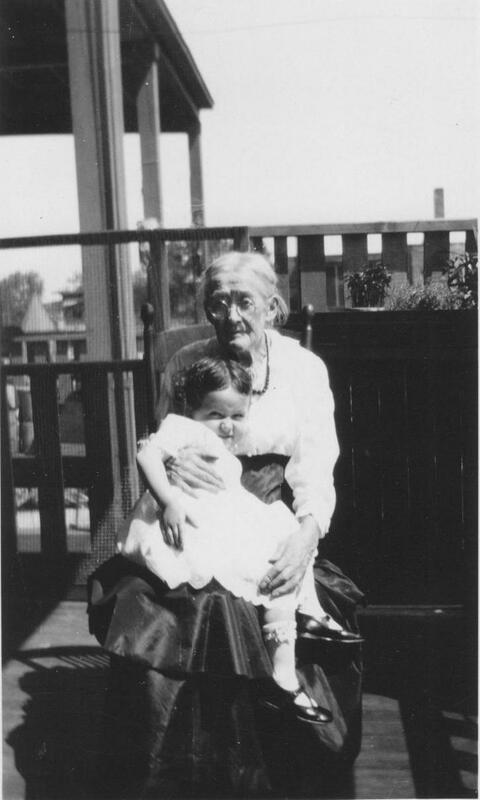 In this 1925 image, Rose Grobner Hansen is with her grand-daughter Shirley Russell (1922-2005). By the time ownership of the home finally transferred outside the family in the late 1950’s, 4 generations of my pedigree had lived there, including my mother. This one residence, more than any other in my research, represents my family’s genealogical center, that one place that served as the family’s focal point through the generations. My grandmother would often charmingly share stories of family and friends with my brother and I, using the “house on Kimbark” as a reference point. With the family having left Chicago long before I was born, I was obviously at a loss for many of the tales, yet still tried to absorb as much as I could. Here is a recent picture of the house, taken only a few weeks ago. The structure’s footprint still bears a remarkable similarity to the 1895 Sanborn Fire Insurance Map above. 7042 S. Kimbark, Chicago (IL), August 2012. 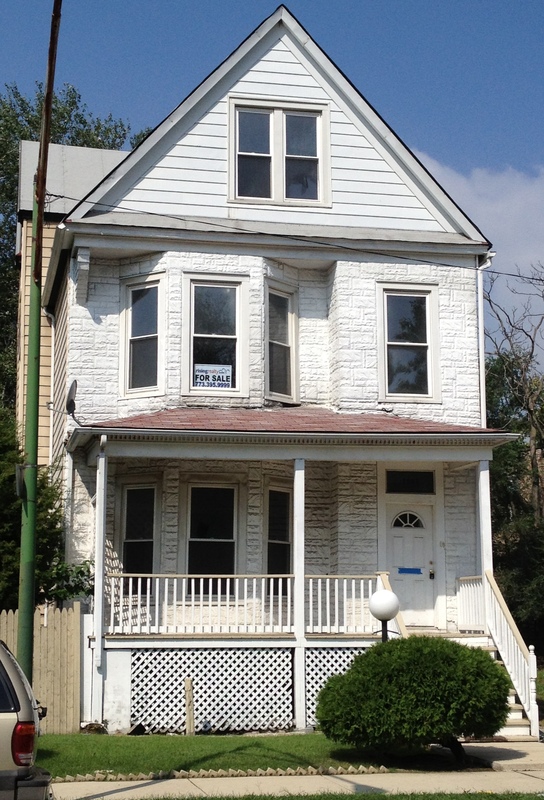 Note the sign in the 2nd story front window: “For Sale.” The genealogist in me would relish the opportunity to purchase the property and reclaim “the house on Kimbark” for the family. It would certainly make for a good story, wouldn’t it? As my first ancestor to settle in Chicago, Sophus Soren Hansen, my g-g-grandfather, has always been of particular interest to me. Despite his arrival in the Windy City in the 1880’s, Sophus’ early years there always puzzled me. With a common surname, differentiating him from any other similarly named Hansen was difficult, to say the least. Sophus Hansen married Rose Grobner in November 1895 in Chicago, and the couple had 3 children over the next dozen years. Yet one additional child, Josias, was born much earlier in 1888. Given how young Rose would have been then, and how long Sophus had already lived in Chicago, I suspected an earlier marriage, yet was unable to definitively link him to someone other than Rose. 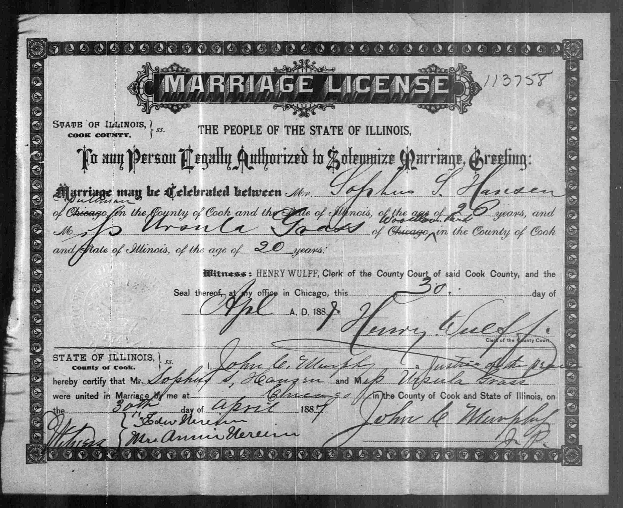 Sophus Hansen & Ursula Grass marriage, 30 April 1887 (#113758); Cook County (IL). A good candidate, to be sure, but I was still not certain that this was my Sophus. Things became more clear, however, after my recent visit to the Cook County Recorder of Deeds office. After looking through the Tract Books for the family’s longtime property at 7042 Kimbark, Sophus’ name appears on both a mortgage and warranty deed, dated in the summer of 1887. After studying the books themselves, I found this reference: “This indenture made this twenty eighth day of July in the year of our Lord one thousand eight hundred and eighty seven between Sophus S. Hansen and Ursula Hansen his wife….”. The deeds reference Sophus’ acquisition of the property on Kimbark that was ultimately held by the family for decades, well into the 1950’s. By naming Ursula, this deed is the first document I found that links Sophus Hansen with his first wife. As you can see, Josias’ mother is clearly Ursula Grass, as I suspected. Also note the address on Kimbark. Success! The Cook County marriage I had discovered earlier is indeed the correct record of marriage. With this important find, Sophus’ early years in Chicago are now more in focus. After arriving in the city in the early 1880’s, he lived in an apartment building at 6904 Cregier for a few years. Sophus married Ursula Grass in April 1887, and Josias Hansen was born in November 1888. Around this time, the couple also acquired property at 7042 Kimbark. Ursula died in 1895 and is buried in Oakwoods Cemetery in Chicago in the Grass family plot, Section J1, Lot 533. Sophus remarried a few years later, and began a new family, remaining at the Kimbark address until his death in 1945. On my recent research trip to Chicago, there were a number of memorable finds and ancestral breakthroughs. Yet one of my most gratifying days was spent driving through the South Side, stopping at, taking pictures of, and trying to visualize those important and life-changing family events that took place at those locales. Before my trip, I had amassed an impressive list of addresses for various bungalows, apartments, schools, churches, and other significant landmarks that defined and shaped my family’s life in Chicago. Using Google Maps, I plotted out all the locations out in advance, and re-ordered my list several times to make sure my route was the most direct possible. No sense criss-crossing the city wasting precious research time! Although Google offers the Street View, nothing compares to being there on location, driving the same streets and viewing the same neighborhood cityscapes. Throughout the day, several locations stood out for me. The first was 8227 S. Indiana. According to my great aunt, this was the house where my grandparents were married in 1942. 8227 S. Indiana, Chicago (IL). The Alderson’s first moved to that address in the mid-1930’s, according to the Chicago telephone directories from the era, and remained there for nearly 20 years. Fast forward to the mid-1960’s, a few short miles away. The Avalon Theater was showing “Disorderly Orderly,” starring Jerry Lewis. In the audience, my mother and father were on their first date. 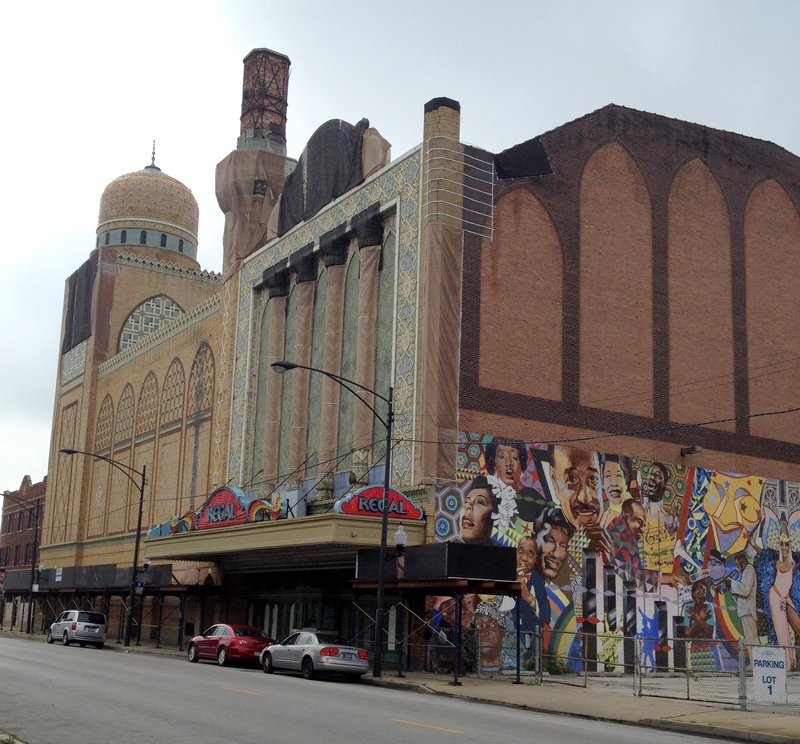 Avalon (New Regal) Theatre, 1641 East 79th St., Chicago (IL). Originally opened in 1927, the historic theatre was renamed the New Regal in the 1980’s. I remember both my parents pointing out that distinctive dome from the Chicago Skyway as we drove past. My parents’ first date must have gone well, as a few years later, they were married at St. Felicitas Church. 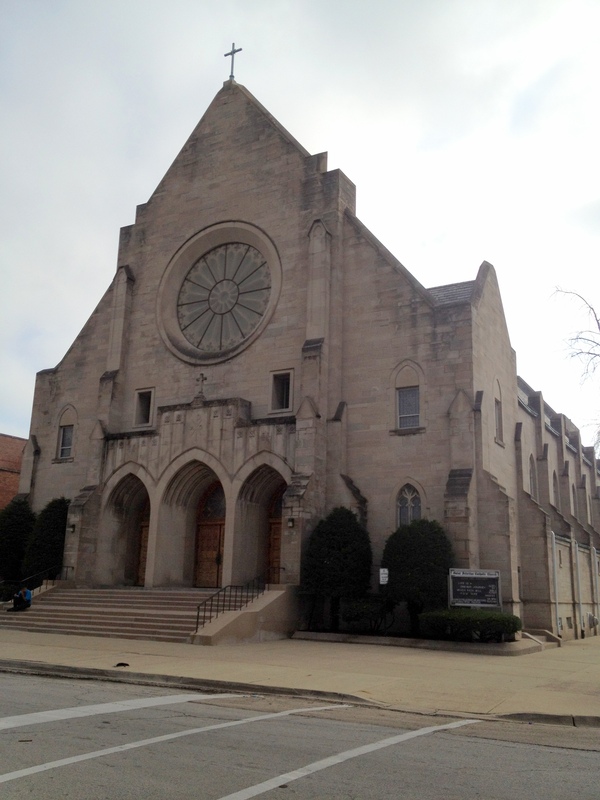 St. Felicitas Church, 1526 E. 84th St., Chicago (IL). Located at 1526 E. 84th St., the church is again only a short distance from the other landmarks, schools, and residences that I visited on my travels that day. I thoroughly enjoyed my adventure, touring my family’s Chicago neighborhoods, viewing first-hand the sites and locations that shaped my family’s narrative. Yet perhaps the most rewarding part of my journey will be when I sit down with my parents to share and discuss my trip and findings. Perhaps I’ll glean some new insight into their experiences there in the South Side or learn about new locales that I’ll explore on my next adventure to Chicago. In a few weeks, I’m headed to the Windy City for a few glorious days of research. With my professional and family life as it is, I have to maximize that precious research time, and an upcoming research trip motivates me like nothing else. Although life has gotten in the way (as it often does) the last few weeks, I’m now focused on completing my research agenda and itinerary. I’ve pondered the genealogical questions I’m hoping to resolve, identified the sources I’m anxious to jump into, and mapped out the different locations I’m headed to. With a 5-day schedule jam-packed from dawn to dusk (and later), my agenda includes visits to the Newberry Library, Chicago Public Library, Cook County Recorder of Deeds, Probate Division of the Cook County Clerk of the Circuit Court, Chicago History Museum, local churches, area cemeteries, and South Side neighborhoods. I’ve not even mentioned the Chicago regional branch of the National Archives or the Polish Museum of America! Yet I’ve also learned from previous trips. Anxious to fit as much as I can into one trip, I’ve often not given myself the opportunity to truly follow a new discovery or pursue an intriguing avenue of research. Perhaps that speaks to something other than my research habits, but on this trip, I’ve allowed myself a “free agent” day where I will go wherever my research from that week takes me. With my family’s deep roots in the city, this trip is truly just the clichéd “tip of the iceberg.” Indeed, as I’ve written before, all eight of my great-grandparents lived in Chicago at some point in their lives, and all but two of them during the 1909-1915 time period. I could research non-stop for weeks and still barely scratch the surface of my family’s narrative in the city. Given that, I’ll be thrilled with whatever discoveries are made. As I’ve written about before, both sides of my family have deep roots in Chicago. One personal area of interest is learning more about the South Side neighborhoods my family lived in, and particularly in finding images of my ancestors’ homes. Although certain Windy City streets resonate throughout my family’s history, one of the most important is Kimbark. 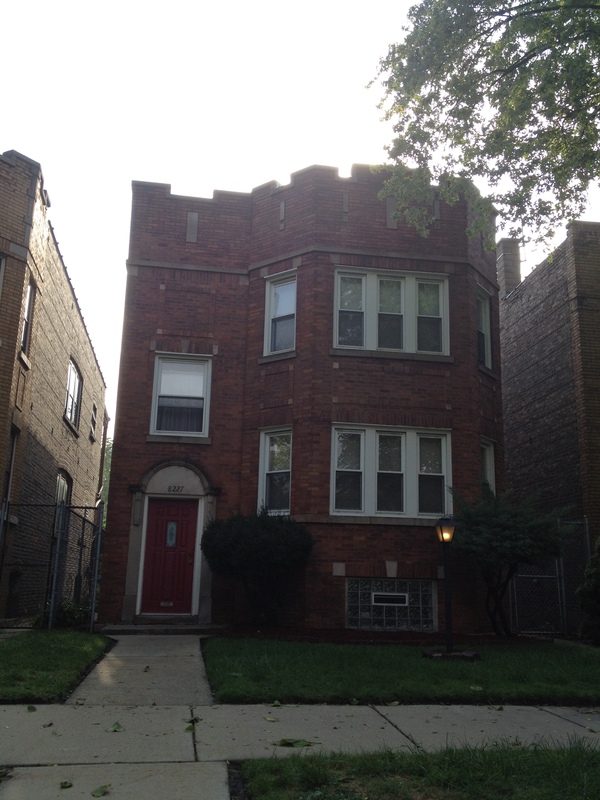 According to the Chicago city directories, Sophus and Rose Hansen first appear at 7042 S. Kimbark Avenue at the dawn of the twentieth century, a few years after they married in 1895. Over the years, Sophus and Rose raised their family there on Kimbark, and also sheltered Rose’s parents in their later years. Leona, a daughter, married Fenton Russell in 1918, and they, too, resided at the house while starting their own family. A crowded house, indeed! In all, the family spent approximately 50 years at the S. Kimbark Avenue house. Finding historic images of the Kimbark house and the neighborhood has been challenging. Although several family photographs show the front step or other features of the home, I have been unable to find an historic image that displays the house in its entirety. Enter the Cook County Assessor’s Office. With their free online database, users can search by address, neighborhood, PIN, and a number of other options. A quick search for 7042 S. Kimbark returns the property details for the home, including the assessed value, market value, building description, type of construction, square footage for both the home and property, even the number of bathrooms. Most importantly, it identifies the approximate age of the home, as well as a recent photograph of the structure. According to the Assessor’s Office entry for 7042 S. Kimbark, the house is approximately 109 years old, which dates its construction to c.1903. Although not exactly aligned with the Hansen’s first entry in the city directory, it is close; further research is certainly needed. I’ll need to review the Sanborn Fire Insurance Maps for the neighborhood, and land and property records are near the top of my research agenda for my upcoming Chicago research trip later this summer. The image above was taken in March 2007. When I first discovered the Cook County Assessor’s database, the image then displayed for 7042 S. Kimbark was dated March 2000. I may not currently have an historic image of the Kimbark home, but I at least have two contemporary images, giving two different views of the structure. For many years, the naturalization laws in force in the United States – up to 1922 – indicated that a non-native born woman attained citizenship when her husband did, or when she married an American citizen. Known as derivative citizenship, this process also applied to children when the father naturalized. The plot thickened in March 1907, when a new law stated that a U.S.-born woman would lose her citizenship if she married an alien; she could, however, re-attain citizenship if her husband naturalized. A more detailed study of the laws and their implications for genealogy research can be found in Marian Smith’s outstanding article in NARA’s Prologue. Born in Chicago in March 1897, Leona Hansen married Fenton Harvey Russell in October 1918. A draftsman by trade, Fenton was born in Toronto, Ontario in July 1883, and first immigrated to the United States in 1909, quickly settling in Chicago. He later filed his Declaration of Intention in the Superior Court of Cook County, Illinois in February 1919, meaning that at the time of his marriage to Leona, Fenton was still legally an alien, a non-U.S. citizen. By saying “I do,” Leona forfeited her status as an American citizen; indeed, her entry in the 1920 Census identifies her as an alien. Leona Russell listed as an alien (far right); note the "X" for the year of immigration. 1920 US Census, IL, Cook, Chicago, ED 335, p. 11B. After several modifications to the 1907 law, Congress finally reinstated citizenship to those affected women in July 1940, although they still were required to take an oath of allegiance to the United States. This explains Leona’s 1940 oath that I found at the launch of my genealogical journey, and closes a particularly fascinating chapter in American legal and immigration history. Image from Leona Russell's Oath of Allegiance, U.S. District Court, Chicago, Illinois, 6 December 1940. Ironically, Fenton became a U.S. citizen in October 1922, a few short years after his marriage to Leona. She would have to wait 18 more years. Few things are as exhilarating for a genealogist as looking through old family photographs and discovering something new, an important clue or detail that was overlooked or missed at the first glance. 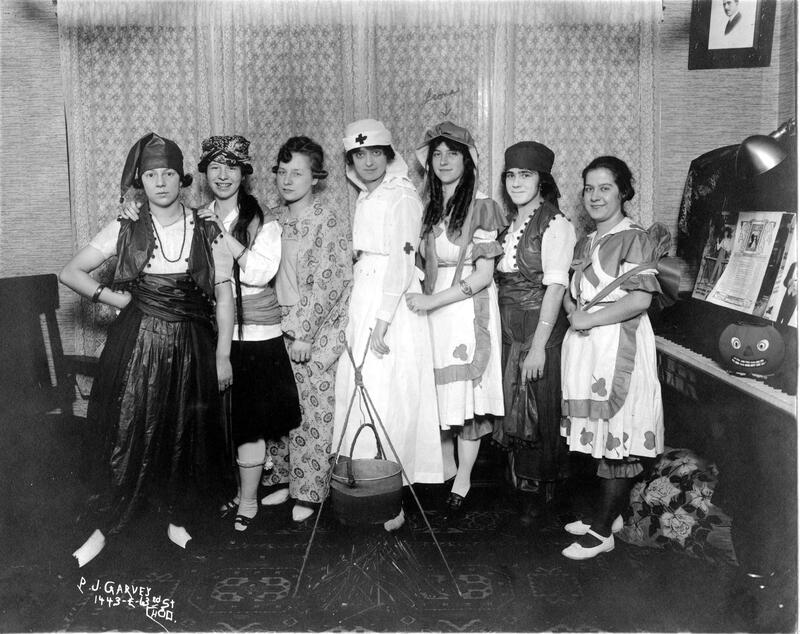 One such example is a set of photographs I have of Leona Hansen, my great-grandmother, and a group of her teenage friends, each in in various costumes and slumber party-wear. Born in Chicago in 1897, Leona Hansen lived at 7042 Kimbark for many years with her parents, Sophus and Rose. After her marriage in 1918 to Fenton Harvey Russell, Leona and her new husband continued to reside at the same address. Later in life, Leona moved to New Buffalo, Michigan, and died in February 1981 in Michigan City, Indiana. Moving right to left, Leona is the third from the right, marked with a “Leona” above her. A number of details immediately jump out from the image. One is the decorative pumpkin on the piano on the right, indicating that the picture was likely taken around Halloween; the girls’ costumes reinforce this idea. The image was likely taken in one of the girls’ homes, as the interior furnishings suggest. The portrait on the upper right corner could potentially be an important clue, but I unfortunately do not recognize the subject. Another important clue is the photographer, identified on the lower left: Garvey, 1443 E. 63rd St in Chicago. That address is fairly close to Leona’s house on Kimbark, another good sign; further research with the Chicago city directories may clarify the studio’s years of operation, thus narrowing the approximate year of the photograph. The other young women in the photograph are all unidentified, but are presumably classmates; this verifies my estimated years for the date of the photograph. At the time I scanned the photographs, I was so focused on the fact that Leona was in each one, I missed several of the key clues mentioned above. I need to spend some time studying both Maureen Taylor and Colleen Fitzpatrick‘s books on photographs to glean additional clues from each of the images. Many questions still remain: Who are the other young women? What school did they attend? Where was the picture taken? How was Halloween celebrated in the World War I era? Even with one simple image, the research is never done!